For the first time in Lille women playing basketball took centre stage on their local TV station. It just happened to be Women's Day and Bourges Basket with their three Olympic silver medallists were visiting. The publicity for the game was nice but the pressure proved to be too much for Villeneuve d'Ascq. In the two other live games the hosts, Arras and Charleville-Mézières came out on top. Villeneuve d'Ascq's contest with Bourges Basket lasted about five minutes with them leading (7-5). Afterwards it was one-way traffic with Bourges Basket winning comfortably (87-48). The writing was on the wall by half time with Bourges leading (50-28) and with Nwal-Endéné Miyem (in picture) having a perfect shooting day. Miyem had 13 points at the break, finishing the game with 22 points in just 22 minutes on the court. She was a perfect 7-from-7 from open play and also 7-of-7 from the free-throw line. As usual the Bourges players shared the scoring in a balanced offensive effort with four other players finishing in double digits. Styliani Kaltsidou, Marissa Coleman, Christelle Diallo and Pauline Krawczyk contributed 13, 12, 11 and 10 points each. For Villeneuve d' Ascq Lenae Williams and Olayinka Sanni were the main scorers with 18 and 16 points apiece. With this victory Bourges can finish no lower than second place at the end of the regular season. Lattes Montpellier escaped from Basket Landes with the victory (71-66). 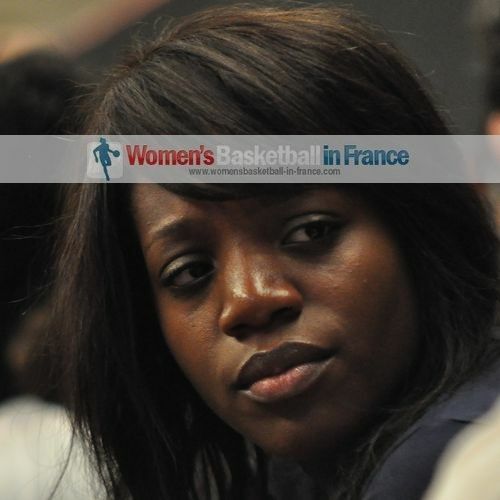 Montpellier were again not complete with Edwige Lawson-Wade joining Fatimatou Sacko on the injured list. However Géraldine Robert - back from suspension - led the way with 20 points while Virginie Brémont (in picture) stepping into the shoes of Lawson-Wade added 11 points. For Basket Landes the guard duo of Olivia Epoupa (4 assists), Carmen Guzman (3 assists) combined for 31 points while Kamila Stepanova put up her best offensive display of the season with 13 points. When it comes to playing basketball on TV, then Charleville-Mézières are the masters. After a poor first quarter against Toulouse in which they trailed (10-14), they stepped on the turbo and took the lead for good on the back of a 14-0 run in the second quarter. Toulouse managed just 4 points during this run and went into the interval trailing (18-34) with the contest being over. The players from Toulouse had no legs as this was their third game in six days. The basketball was not that good the rest of the way. But Charleville-Mézières still put on a show with buzzer beaters as they strolled to victory (62-41). Sheana Mosch and Aminata Nar Diop were the only two players from either side to reach double digits with 15 and 10 points. 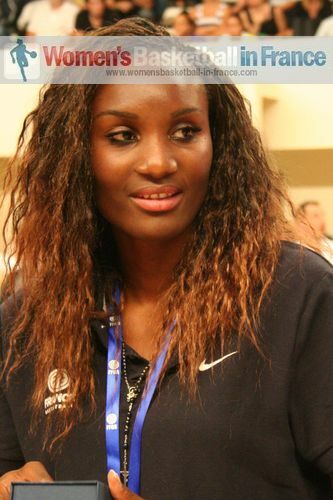 Laëtitia Kamba (in picture) returns from injury and USO Mondeville won. Beating Lyon (67-57) on the road eases their relegation issues while denting Lyon's top 4 ambitions. For Lyon Danielle Page was on form and fired in 24 points. 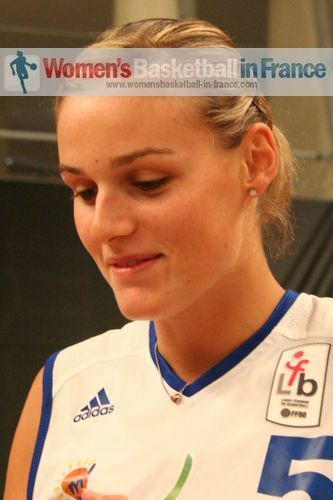 Emilija Podrug added 16 while no other player scored more than 4 points from Lyon. For Mondeville Amanda Lassiter, Kamba, K. B. Sharp and Giedre Paugaite shared the offensive work with 17, 15, 12 and 11 points receptively. Gunta Baško-Melnbārd's first club in France was Tarbes - from 2004 until 2006. 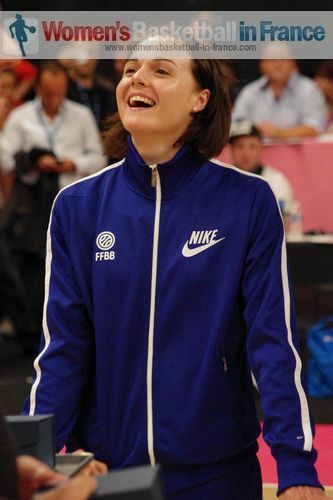 In her first match back in five years in Tarbes she hit 19 points to lead Nantes-Rezé to victory (70-56) over her former club. Marielle Amant was also strong at both ends of the court with 16 points and 9 rebounds. For Tarbes Paoline Salagnac and Angelica Robinson were the only players to get going offensively with 22 and 17 points each. With Perpignan, Lyon and Basket Landes all losing Nantes-Rezé find themselves back in the hunt for a top four finish. Aix-en-Provence ended their own relegation battle by beating Hainaut Basket (70-65). Once again new signing Sandra Ygueravid's impact was crucial by scoring 20 points and dishing out 7 assists. Hainaut Basket must win their next match against Villeneuve d'Ascq by more than 5 points to have any chance of escaping from the relegation zone. Arras have kept their challenge alive for playing basketball in the LFB next season with a victory against Perpignan (71-55). Olesia Malashenko was the match winner for Arras with 23 points and 11 rebounds.